Advantages: Tells the story of the Luftwaffe's ground attack units including aircraft and operations; concise and interesting narrative; large, relevant photos; nice profiles - terrific inspiration for modellers. The Classic Colours Luftwaffe Colours project is an ambitious series of books written by an ensemble cast of some of the best respected Luftwaffe experts from around the world. The focus of the series is the camouflage and markings of Luftwaffe aircraft from the first tentative challenge to the Treaty of Versailles to the last days of the Third Reich. The Jagdwaffe section concluded with 20 books in that series alone, but Classic Publications has been covering more specialised areas ever since. 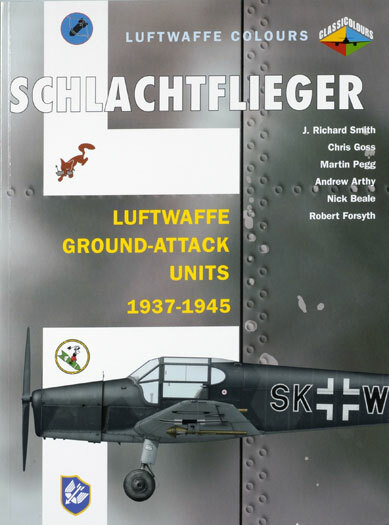 Classic Publications has now released their new Volume on the Luftwaffe's ground attack units - "Schlachtflieger". The book commences with a summary of early bombing experiences in the First World War, and the uniquely German concept of specialised ground attack. The text continues with a description of development of the concept between the wars, including rhe failed Heinkel He 50 and Ernst Udet's testing of two two Curtiss F11C-2 Hawk dive bombers. Following a discussion of the Hs 123 and Ju 87, the book describes the testing ground for these new aircraft and tactics during the Spanish Civil War. The bulk of the book then focuses on the use of ground attack units during the Second World War, starting with "tip and run" tactics over Britain, life and death struggle on the Eastern Front, and ground attack units in the Mediterranean theatre and Norway, wrapping up with short chapters on specialised units including Sonderstaffel Einhorn, III./KG 200 and Kommando Schenck. This new title comprises 96 pages in the familiar large format (303mm x 206mm) of the Luftwaffe Colours series. Around 250 photos, mostly of the wide variety of aircraft used in the Ground Attack role, are one of the highlights of this title. Captions are detailed and relevant, and provide useful information about the colours and markings of the subjects. The side profile illustrations are very attractive, and cover a wide selection of a wide selection of ground attack aircraft.